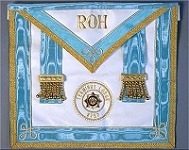 Friendly societies adopted their aprons by simply copying the long established freemasons. The freemasons adopted theirs from the ones used by medieval stonemasons. 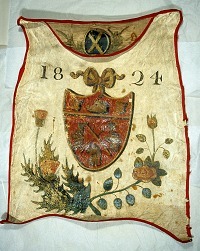 By the end of the 19th century countless organisations were wearing Masonic-style aprons on public and ceremonial occasions to celebrate unity, demonstrate affiliation and indicate position and status. 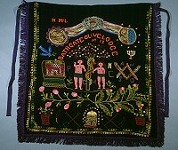 The images below are just some of the aprons that survive in collections across the Lothians and Fife, representing just a few of the hundreds of organisations and thousands of individuals that invested in these articles. At the outset of the 19th century aprons were often homemade but by the end big suppliers dominated the market. 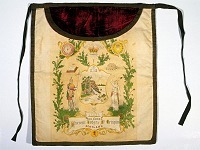 Aprons were purchased by mail order or at Masonic Warehouses in any city. Virtually all conform to the standard Masonic pattern - a rectangle of cloth with a 'lap' or flap at the top and designed to be secured around the waist. The only local exceptions were Free Gardener aprons, chest high and ankle length and the wonderful collection once owned by the Society of Apronmen in Kirkcaldy and now in Kirkcaldy Museum and Art Gallery.